Taxpayers are handing businesses £93bn a year – a transfer of more than £3,500 from each household in the UK. The total emerges from the first comprehensive account of what Britons give away to companies in grants, subsidies and tax breaks. Many of the figures, especially on direct payments, are hard to unearth, as they are scattered between various arms of the state. The government admits: “There is no definitive source of data about spending on subsidies to businesses in the UK.” Many of the companies receiving the largest public grants over the past few years previously paid little or zero corporation tax, the analysis shows. They include some of the best-known names in Britain, such as Amazon, Ford and Nissan. 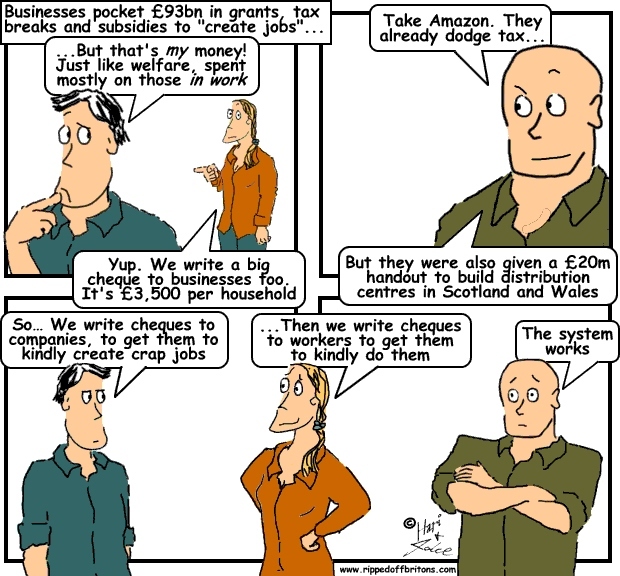 For example, in 2012, Amazon was attacked by MPs on parliament’s public accounts committee for avoiding UK tax. Yet in the same period, the online retailer was awarded £16.5m in grants by the administrations of Scotland and Wales to help build distribution centres. To link the Wales plant to the transport network, the Welsh assembly built the mile-long “Ffordd Amazon road” at an additional cost of £3m. The main subsidies include: £14.5bn in subsidies and grants (rail, defence, etc); £44bn in Corporate tax exemptions (mainly write-off expenses, and investment incentives); £15bn in hidden transport subsidies (rail, airline); £3.8bn to energy firms. How to bump up UK average earnings? Exclude the (mostly low paid) self-employed from the official calculation. But... they are, of course, included in our “impressive” employment stats!